Since its inception as a country following the dissolution of the former Yugoslavia in 1991, Macedonia has faced extensive pushback and hostility from its southern neighbor Greece. The origin of the contention between the two countries stems from what many Greek supporters feel is the appropriative nomenclature of Macedonia of traditionally Greek right and heritage. Macedonia represents a historically Greek territory located in the northern region of Greece, encompassing the original birthplace of the acclaimed Greek figure, Alexander the Great, and integral facets of prided Greek culture. Over the years, Macedonia and Greece have come to a head over the former’s name, often preventing Macedonia from integrating into pivotal international agreements and unions. Upon Macedonia’s accession into the United Nations, the country took upon the acronym FYROM, the Former Yugoslav Republic of Macedonia, in order to dissolve tensions with Greece. However, Macedonia has previously been blocked from ascending into the larger European community through the European Union and from partnership with the greater Western world through the North Atlantic Treaty Organization, as a consequence of Greek vetoes over the countries’ cultural disagreements. Domestically, the issue has manifested in respective rioting in both countries over acquiescing to the others’ demands over the naming issue and the standpoint of historical allocations, culminating in the 2016 Colorful Revolution in Macedonia. After a failed referendum in Sep. 2018 in Macedonia to propose a name change for the country in order to move forward with its international aims for cooperation, the issue reached consideration by the Macedonian Parliament last month, which voted in favor of the change to resolve the decades-long dispute. And after a contentious debate in Greece, the new name received approval as well. The country will now come to be known as the Republic of Northern Macedonia. With this passage, the new name allowed for NATO accession protocol to be signed Wednesday in Brussels by Macedonian officials. 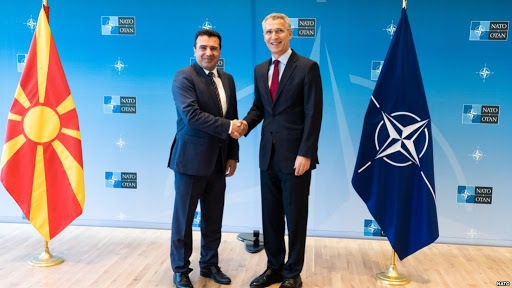 Greece has come forward to say it will be the first to ratify the Northern Macedonia NATO accession, following which the latter will officially take up usage of the new name and begin the process of revising its historical documentation. The NATO ascension proves fruitfully hopeful for the future Northern Macedonia to integrate further into the European Union, and notably loosens the grip of Russian influence in the eastern part of Europe as Macedonia is set to merge closer to the West.